The National Handicapping Championship (NHC) is the focus for NJ Horseplayer, but fellow contest handicappers should give the Horseplayer World Series-based Colonial Downs Handicapping Contest some consideration. This free online contest (any free contest warms my heart) is not only a great practice venue for NHC Tour members, but also offers one seat in the 2013 HPWS in Las Vegas, plus cash prizes for the second- through fifth-place finishers. I will participate from time to time in any HPWS-based contests at Monmouth Park, but otherwise do not go out of my way to play non-NHC focused tournaments, though Colonial's has appeal. Similar to other online contests, the Colonial Downs contest, which kicks off this Saturday and continues through Virginia Derby Day on July 21, players are required to make mythical wagers (on four races per day from Colonial Downs). Interestingly, unless this year's rules have changed, the four contest race wagers progress from a win bet in Race 1 to a superfecta by Race 4. Past leaderboards (I have competed, albeit irregularly, the past two seasons) can get egregiously high, especially for players using bombers who actually hit the board in their exotics selections. As the contest lets players pick four horses as part of their three-horse trifecta, for example, there's a big shot at a big hit. For me, this kind of contest is less valuable in terms of practicing my win-place-show handicapping or experimenting with different theories than with, say, the free upcoming Del Mar Handicapping Contest (NHC seats to the top two finishers this year), which focuses as well on bankroll management, but it presents an interesting way to get into some past performances and take a shot at a worthwhile prize. 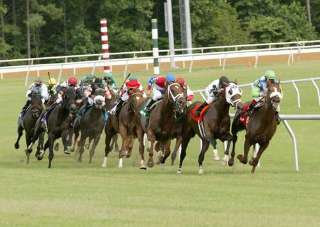 Kudos to Colonial Downs for running with this contest again, and good luck to all those who participate! I wish Colonial Downs still held their NHC contest. It had the same format as the NHC and was worth the 3 1/2 hour drive. It's a nice track, too. I was there the year it opened, on a lark, as my in-laws lived in Richmond at the time and well before I got more involved in handicapping. But I recall it being a pretty nice venue. It is one of the nicer tracks I have been to and the turf course is arguably the best in the country.